By Melissa Lennig on December 9, 2013 15 Comments. This content contains affiliate links. As an Amazon Associate I earn from qualifying purchases. I admire fresh, natural, and simple Christmas decorations like a real pine bough wreath, a basket of pine cones, or a bright poinsettia. The boys and I recently had fun at home learning how to string an Old Fashioned Holiday Garland. I hope you enjoy it as much as we did! Note: For your convenience, this post contains affiliate links. All opinions are my own. 1. Thinly slice the apples and oranges. Place the fruit slices onto a cooling rack and set the rack into a warm oven (180 degrees F.). Crack the oven door so the moisture from the fruits can escape. Leave the fruit slices in the oven until they have dried completely. 2. While the fruit is drying, prepare the Cinnamon Clay by mixing the cinnamon, cloves, applesauce and glue together with a metal spoon or your hands. Cover the dough and allow it to rest for one hour before use. 4. 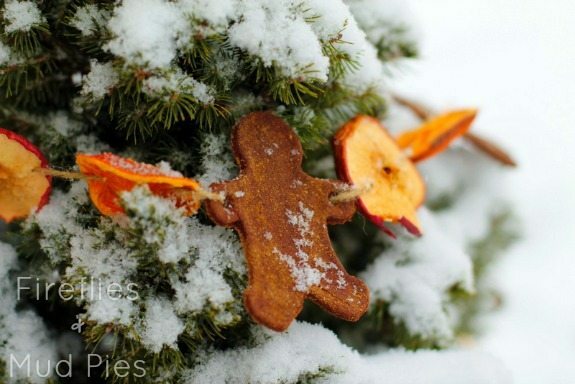 Invite your child to cut out the gingerbread men with the cookie cutter. Use a straw to punch holes on both hands of every gingerbread man. 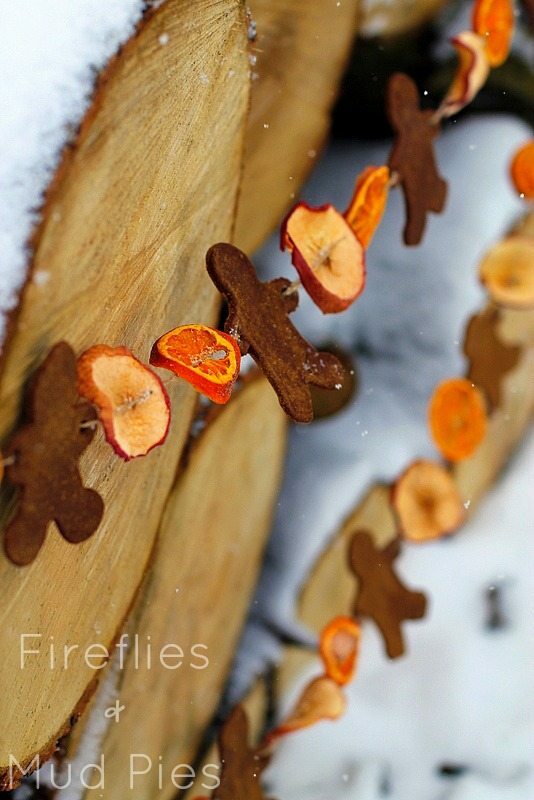 Allow the gingerbread men to rest on a baking sheet sprinkled with cinnamon. When the sheet is full, place it in the oven with the fruit slices. 5. When the fruit slices and gingerbread men are dry, invite your child to string them along twine in a pattern of their choosing. If your home cannot accommodate a garland, place the dried fruit and gingerbread men into a bowl with a handful of cinnamon sticks. Enjoy your natural, spicy potpourri, or share with a friend! 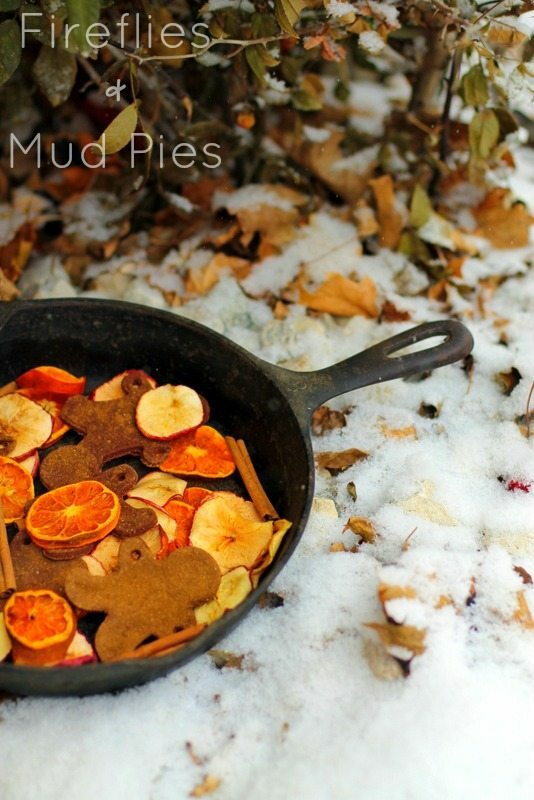 This activity not only smelled delicious, but was a beautiful sensory, fine-motor and early math activity for my children. How did you get the snow effect on you gingerbread cookie? It’s real snow. I took the photograph outside.